In a rich program with gregorian chants alternation sung by tenor Damien Rivière, Johann Vexo plays organ works by de Grigny, Bach, Escaich, Alain, Duruflé, and by Jean LANGLAIS, the "Cantilène" (Suite Brève) and the "Te Deum" (3 Paraphrases grégoriennes). 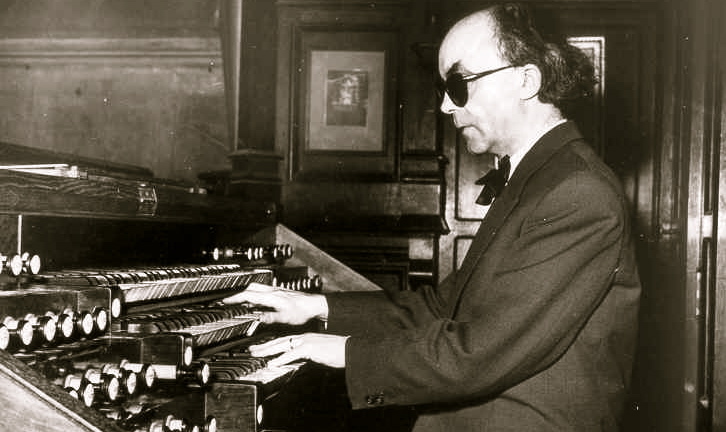 James-David Christie plays organ works by Ropartz, Barié, Duparc, Albert and Jehan Alain, Tournemire, Martinson and, by Jean LANGLAIS, Incantation pour un Jour Saint and "Acclamations carolingiennes" (Suite Médiévale). James David Christie plays also his own "Elégie", in memoriam Jean Langlais. On the Beckerath Organ (4/97, 1962) of Pittsburgh's Saint Paul Cathedral, titular organist Kenneth Danchik plays works by Bach, Marchand, Franck, Roberts, Duruflé, and by Jean LANGLAIS, "Boys Town, place of peace", "Scherzo-Cats" et "Big Texas" (American Suite). For the Prelude to the service, Donald L. Ermitage, the University organist, plays Bach and the Jean LANGLAIS' "Te Deum" (Trois Paraphrases grégoriennes). Marius Popp (Allemagne) plays organ works by C.Schumann, F.Hense, Fletcher, Hakim, Ravel, and by Jean LANGLAIS, Trois Paraphrases Grégoriennes ("Ave Maria, Ave Maris stella", "Mors et résurrectio", "Te Deum"). Perth Festival of the Arts 2017, "Lunchtime Concerts", Mark Splading, organ, Haworth Hodgkinson, gongs. The Perth Festival of the Arts 2017 ("Lunchtime Concerts") present Mark Spaulding, organ, and Haworth Hodgkinson, performing works by Pert, Mc Guire, Thalben-Ball, Stevenson, Searle, Alain, Stockhausen, and, by Jean LANGLAIS, the Deuxième Symphonie "alla Webern" (Prélude- Lude- Interlude- Postlude) and "Prière des Mages", for organ. This program will be presented with the same artists and in the same place at the same time (12:30) on May 19, 22, 23, 24, 2017. Special "Birthdays anniversary" concert : organist Wofgang Kreuzhuber plays organ works by Guilmant, Bovet, Karg-Elert, Bovet, and, by Jean LANGLAIS, Incantation pour un Jour Saint and "Chant de paix" (Neuf Pièces). Festival "Komm Bach", concert "Jeunes talents du CRR de Paris"
The "Young talents of the CRR de Paris" play and sing works by Bach, Fauré, Duruflé, Alain, Dupré, and, by Jean LANGLAIS, "Salve Regina" (Trois Oraisons pour flûte,voix et orgue, 1), the "Mouvement pour flûte et orgue, two from 5 Motets (Chant litanie, O Bone Jesu) and "Regina Caeli" for equal voices and organ. La Maîtrise intermédiaire du CRR de Paris, accompanied by Sylvie Mallet, is directed by Edwige Parat, and Ansel Gross, organ scholar in the class of Sylvie Mallet, is the organist accompanying the 2 other Langlais'works. In their recital, Sandra Debby Gracia de Lima, soprano, and Anton Dornheim, organ, perform Jean LANGLAIS's Trois Prières and "Agnus Dei" from his Missa in Simplicitate. In Bach's Baptism Church, Gereon Krahforst (Germany) plays a program including excerpts of Jean LANGLAIS's Livre Oecuménique. Works by Murail, Gubaidulina, Erb, Gorecki, Kurtag, Mc Millan, Françaix, Perry, and Jean LANGLAIS' "Final" (Pièce pour trompette et orgue).